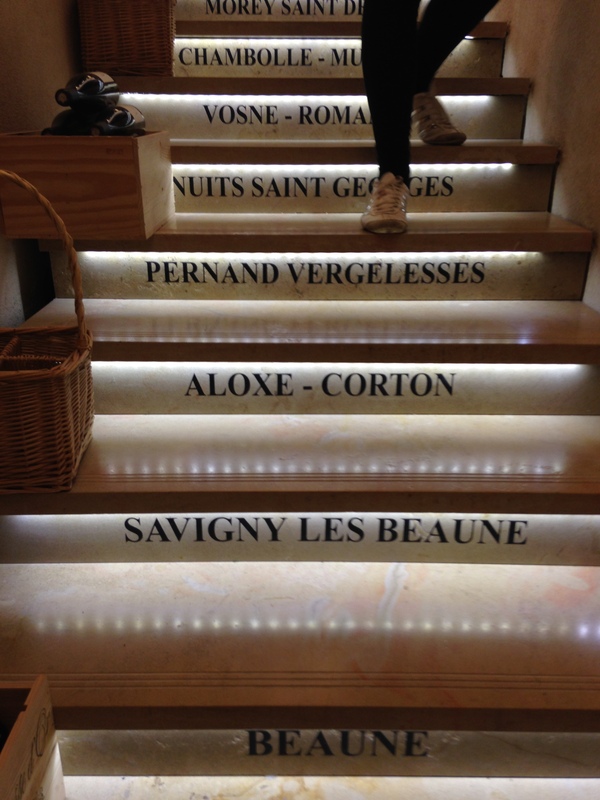 I was really excited to visit two of the most famous areas in France for foodies: Lyon – known as the capital of gastronomy & Beaune – centre of the famous Burgundy wine region. 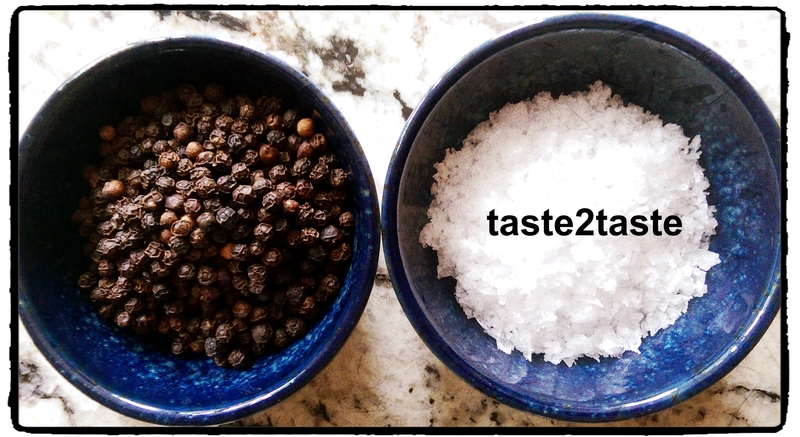 There was so much to explore, see, smell, taste & savour I wanted to share my highlights capturing the essence and giving you a a little taste2taste review. 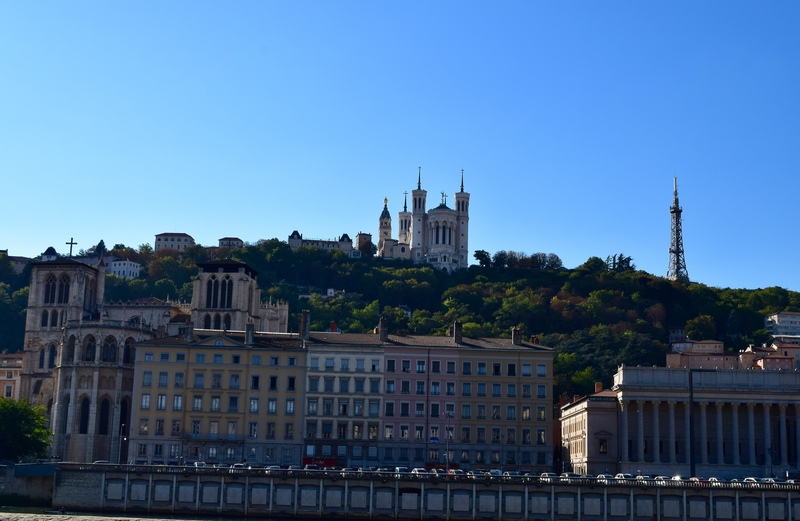 Lyon is picturesque & vibrant with it’s old city (Vieux-Lyon), a UNESCO World Heritage site, the cobbled streets, the traboules (hidden passageways) and the rivers’ Rhône & Saône bisecting the 3rd largest city in France. 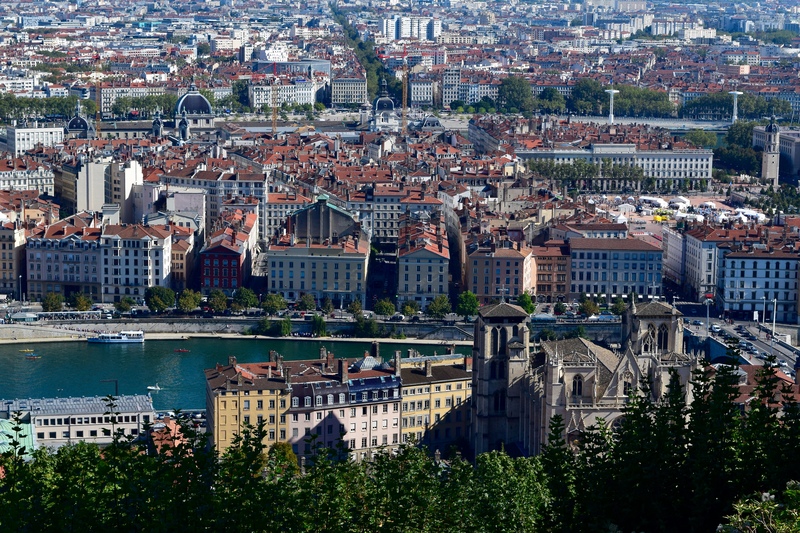 Lyon has many Michelin starred restaurants and the highest number of restaurants per inhabitant in France. 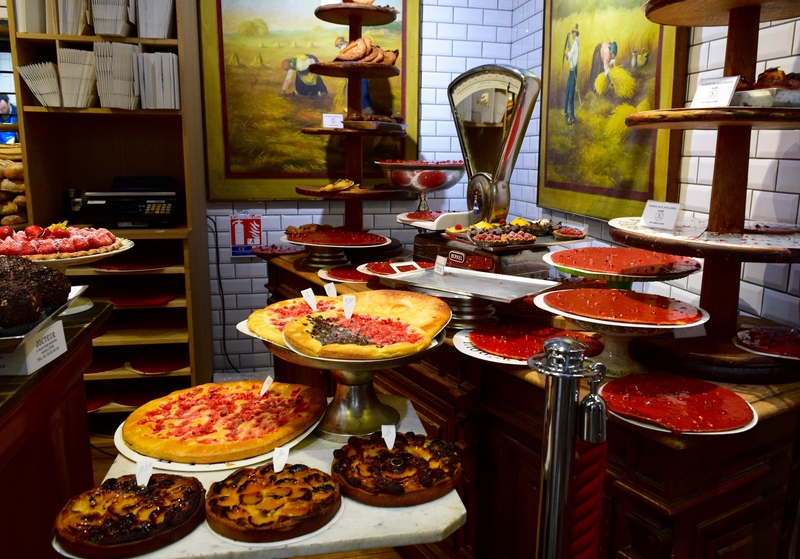 However I focussed on sampling Lyonnaise food in the Bouchons – the traditional family run bistros/taverns, the boulangeries (bakeries) & the covered food market-Les Halles de Lyon – Paul Bocuse, named after the famous French chef. 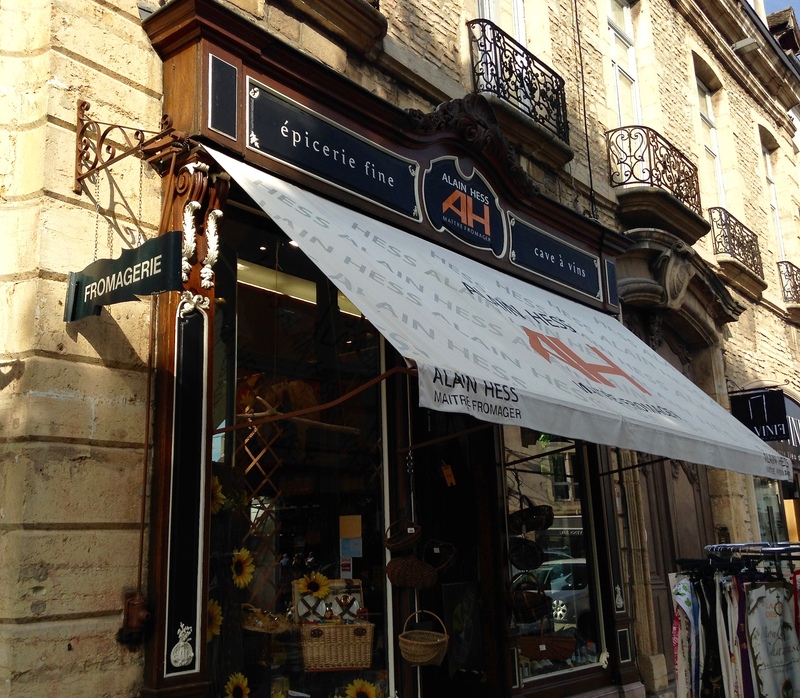 We visited numerous cafes and ordering ” un grand café avec lait chaud” (large coffee with hot milk) became our first stop of the day. 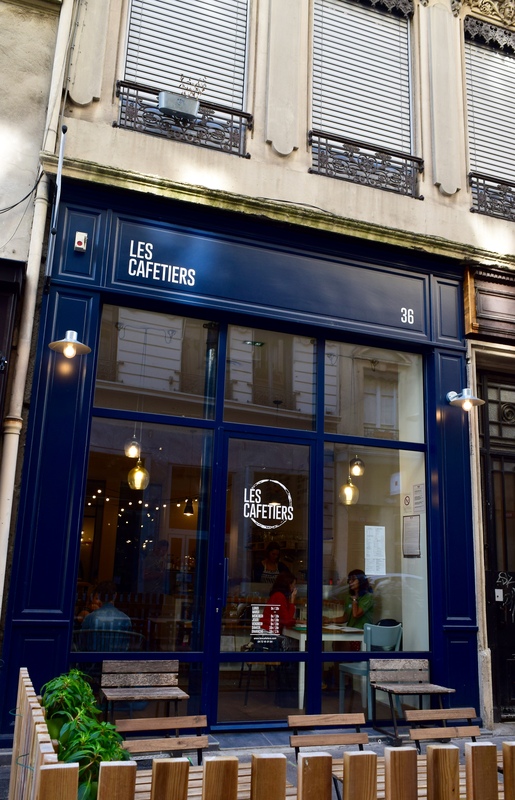 A typical breakfast is coffee and a croissant however we discovered Les Cafetiers, 36 Rue Ferrandière(@lescafetierscoffeeshop) – with the enticing aroma of freshly brewed coffee calling us after lots of walking & talking. 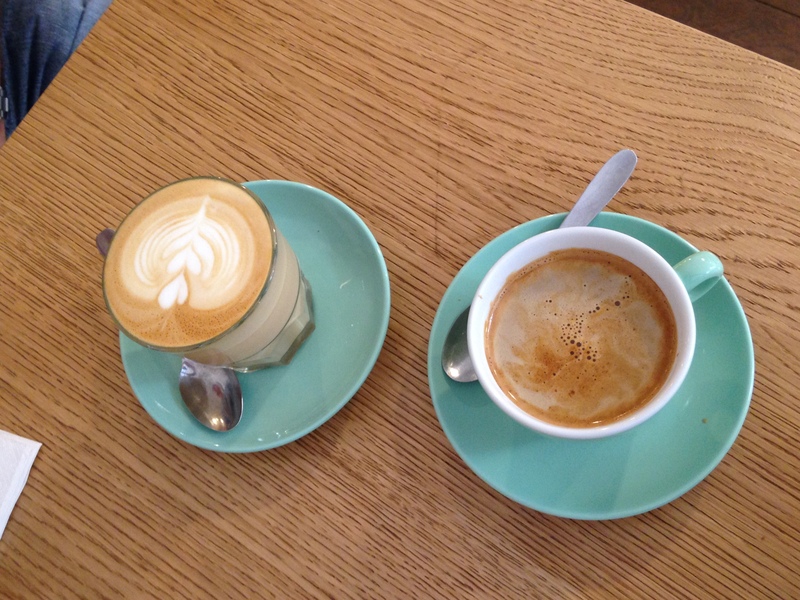 They served a weekend brunch which I ordered in my basic French to be answered by Josh, the friendly barista, originally from New Zealand. 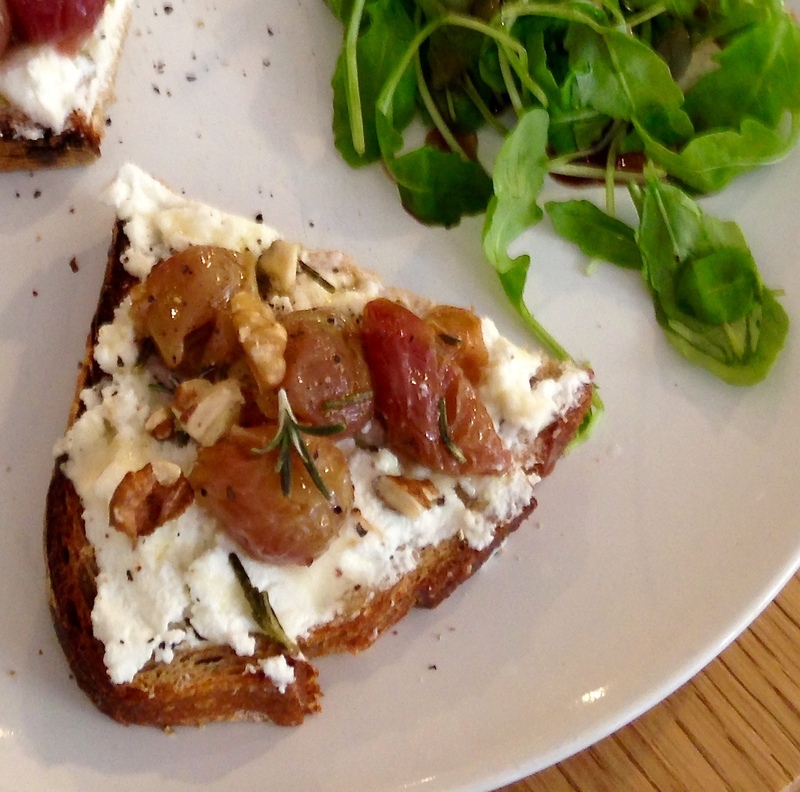 He made us some excellent brews using La Ceiba Guatemala coffee from Coutume (French coffee roaster) accompanied by “Nos Tartine Salees” – toasted rustic bread topped with goats cheese, roasted grapes, rosemary, walnuts & a drizzle of honey. 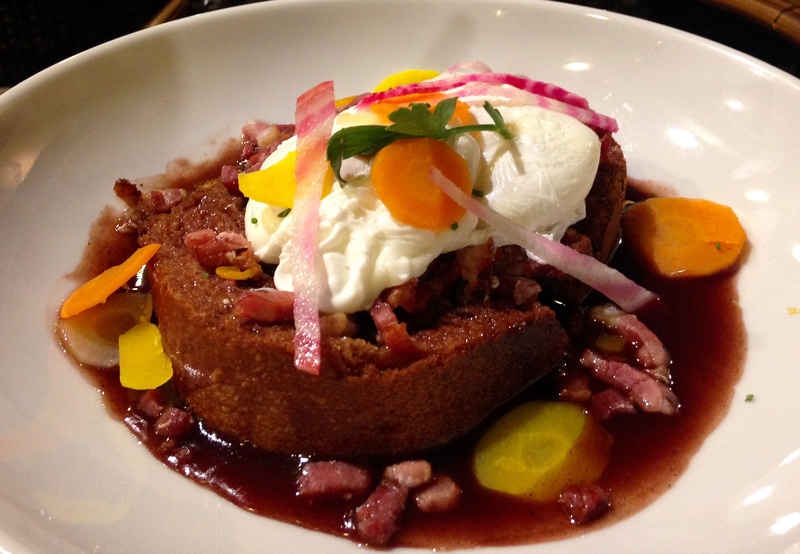 It was delicious with the slightly sweet grapes & honey perfectly complimenting the cheese. 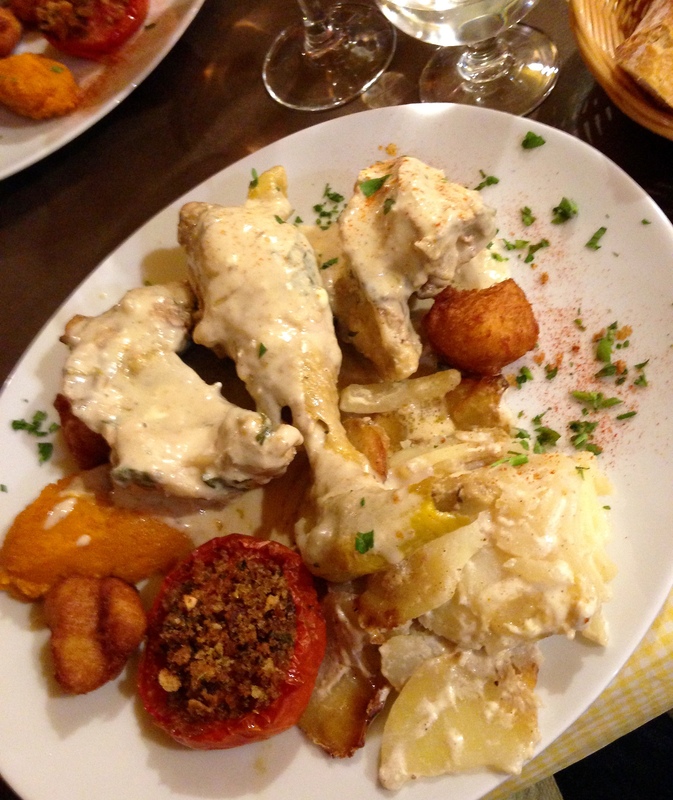 Josh was so helpful, recommending some other great places to eat & drink in Lyon at the weekend, as some places shut on Sunday & Monday. 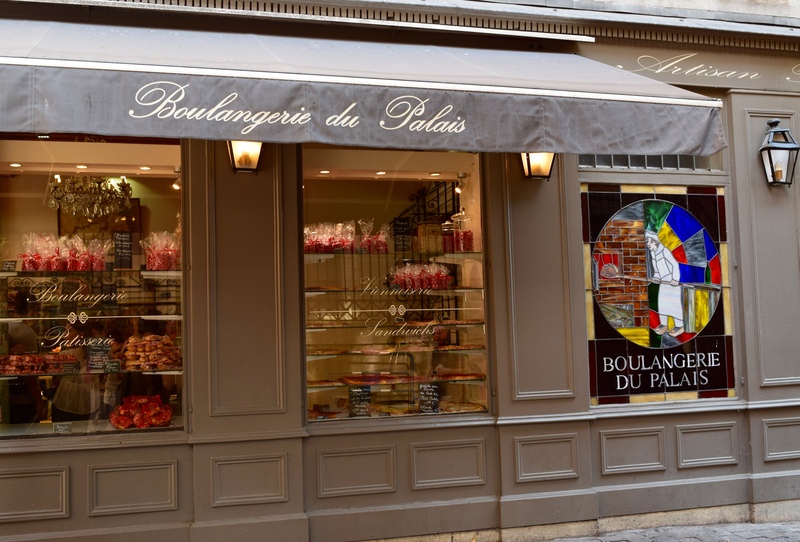 My next highlight is the Boulangerie Du Palais, 8 Rue du Palais de Justice. 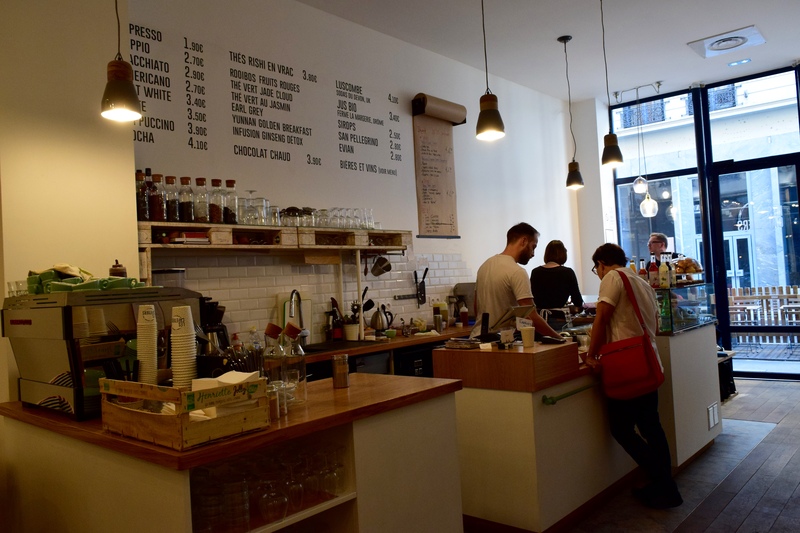 There was always a queue out the door,whenever we walked passed – always a good sign. 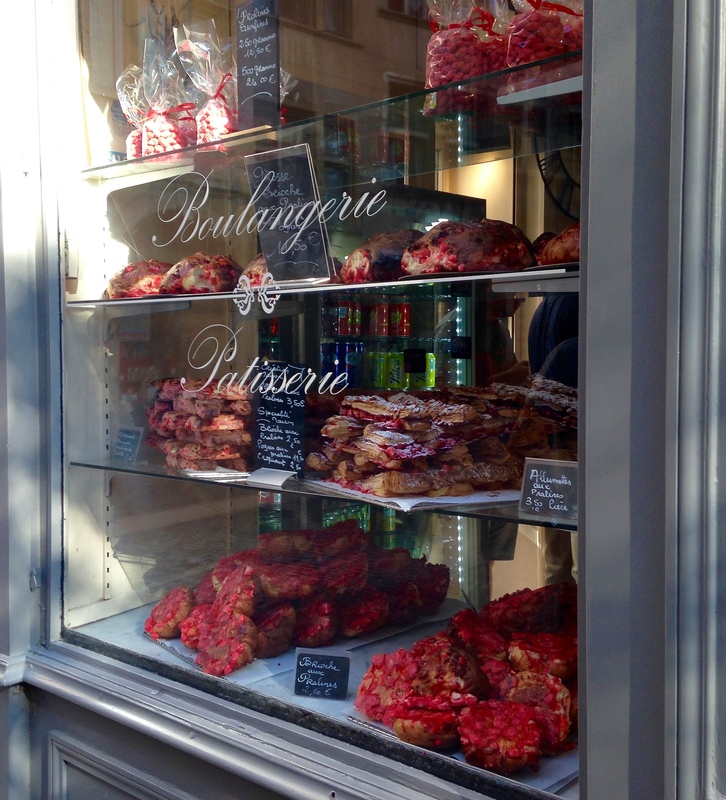 The display of tarts,breads & brioche made with the rose coloured almond confectionary (praline) was inviting. We tried the croquant aux amandes – a crisp textured slice with pieces of almond & rose praline (similar to a biscotti but not as dry) which tasted nutty & sweet. We also had a slice of the clafoutis aux pommes (apple cake) with caramelised apple on top -fruity, sweet, buttery and delicious. We visited Beaune, the beautiful city & wine capital in Burgundy and took in the atmosphere of the walled city, historic buildings and moat. 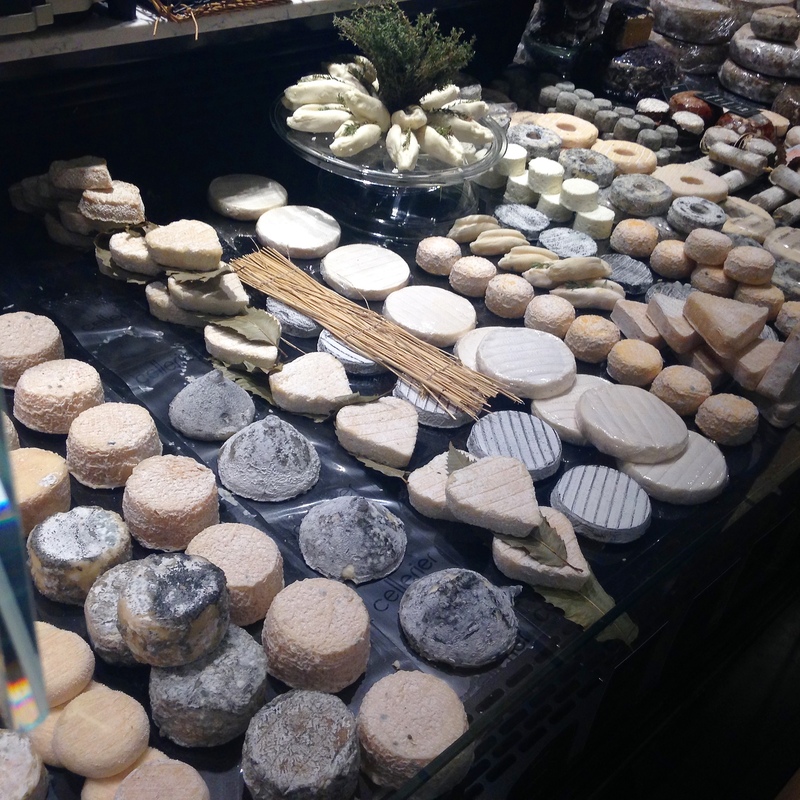 We stopped to sample some amazing cheese at Alain Hess, 21 Côte d’Or, Beaune where they have been making cheeses for 4 generations. I wonder what’s this made of? 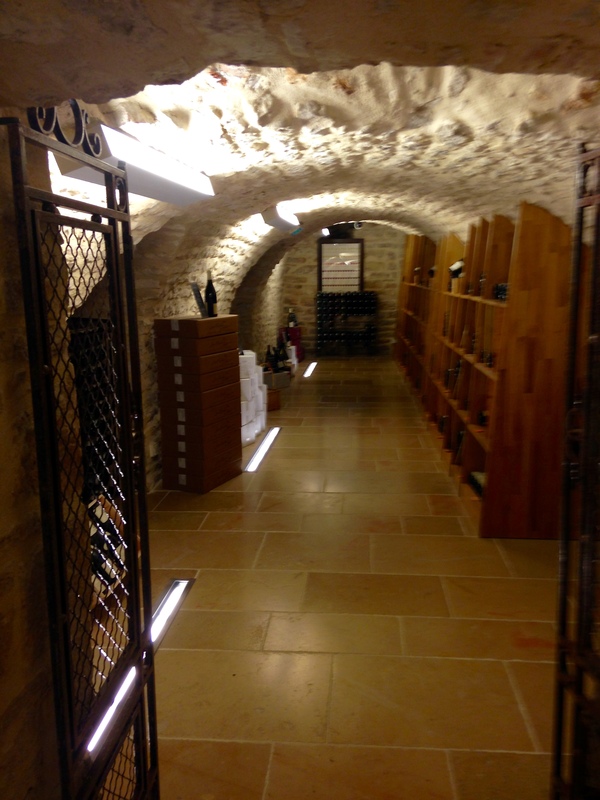 We looked down through the glass floor to a fabulous display of wine in the cave beneath the shop. 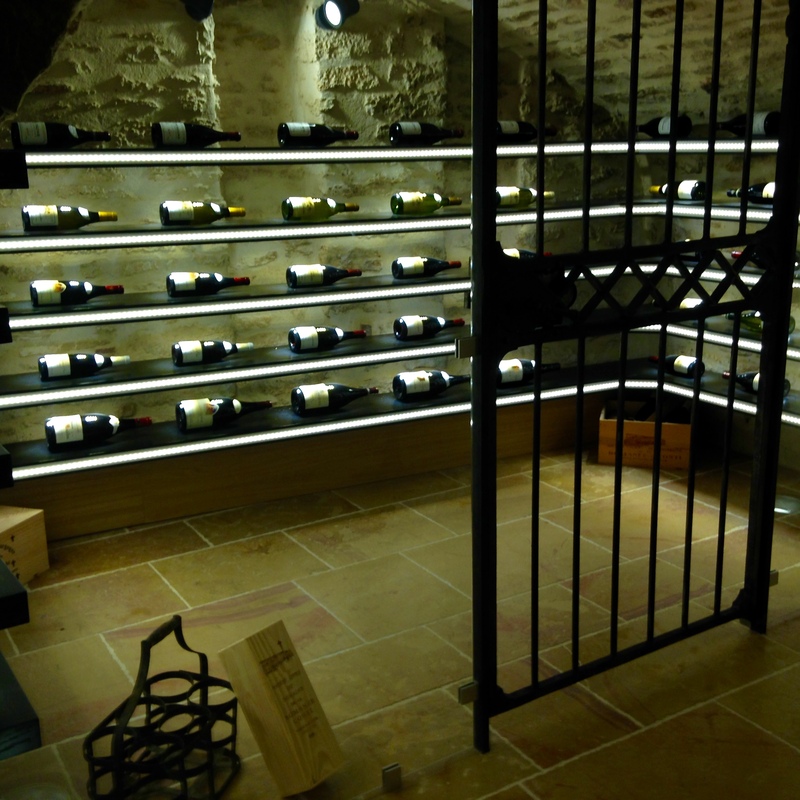 As we descended the steps it was cool & quiet, with bottles nestled in their wooden shelves, beautifully lit adding to the atmosphere. a lot more than 10! 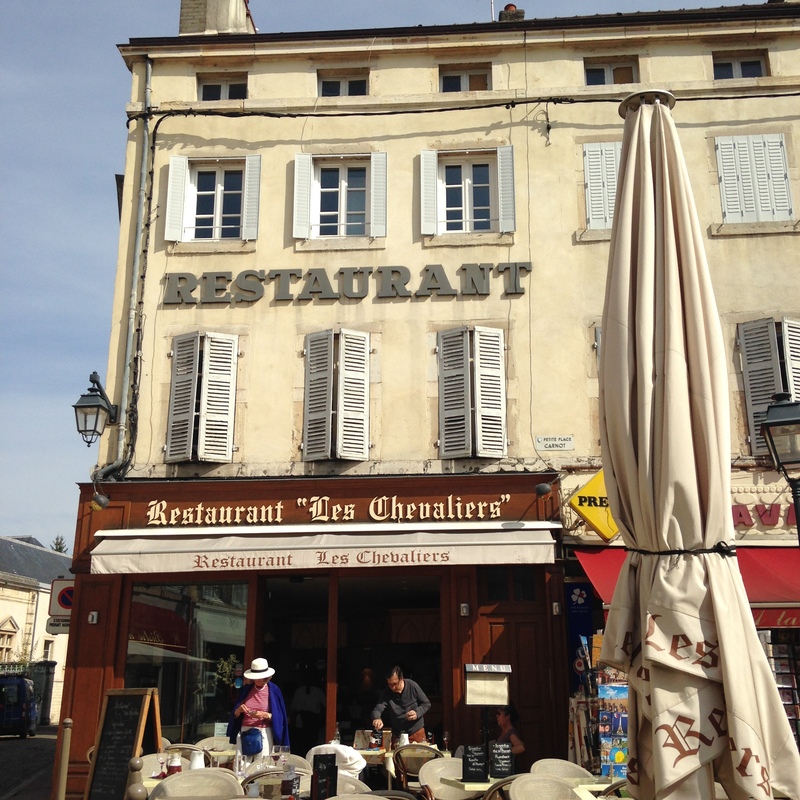 After buying some local wine, so we headed back outside into the sunshine for lunch at Les Chevaliers, 3 Petite Place Carnot in a picturesque square in the centre. 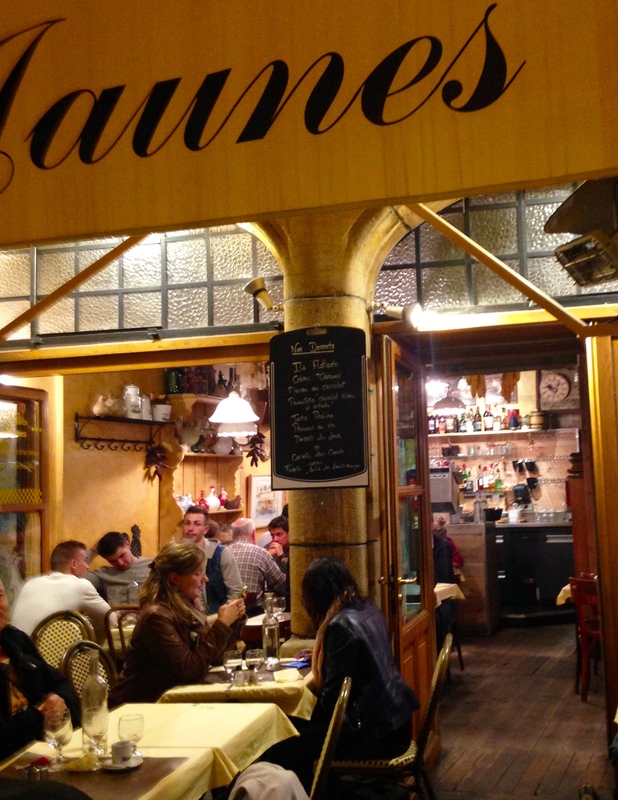 We sat next to a table of locals demolishing plates of snails & seafood, washed down with some local wine & boisterous banter. I opted for the selection of cheeses (picture at the top of the post). They were all delicious with the highlight being a local creamy cheese rolled in fine crumbs of gingerbread from Dijon (picture below right). I asked the names of the others but was embarrassed after the waitress repeated them but a little quickly for me to understand. 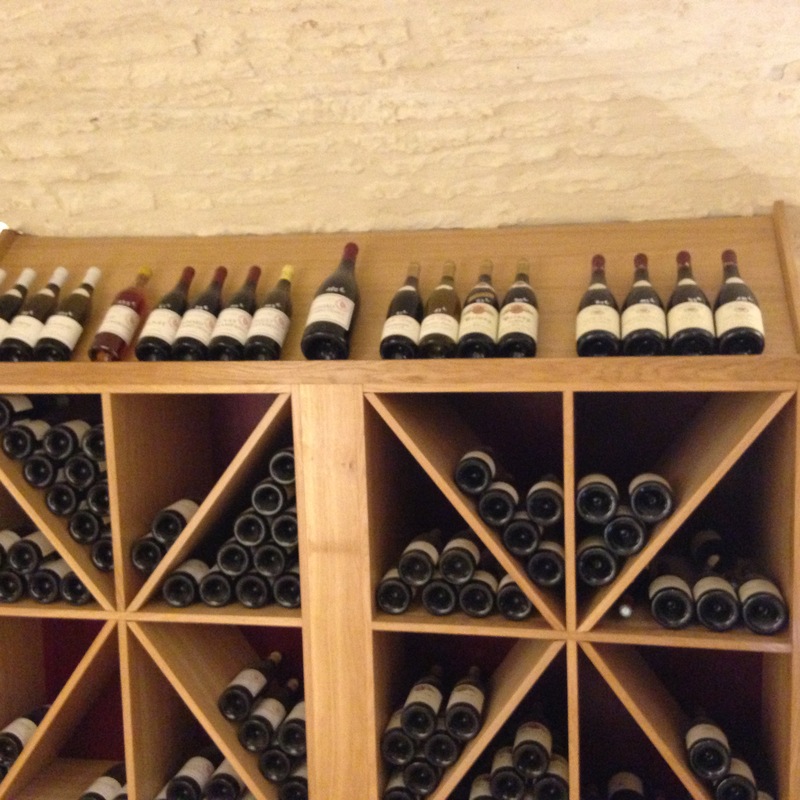 I would have loved to have stayed for a wine tour but we were due back in Lyon for a rendezvous with a restaurant. 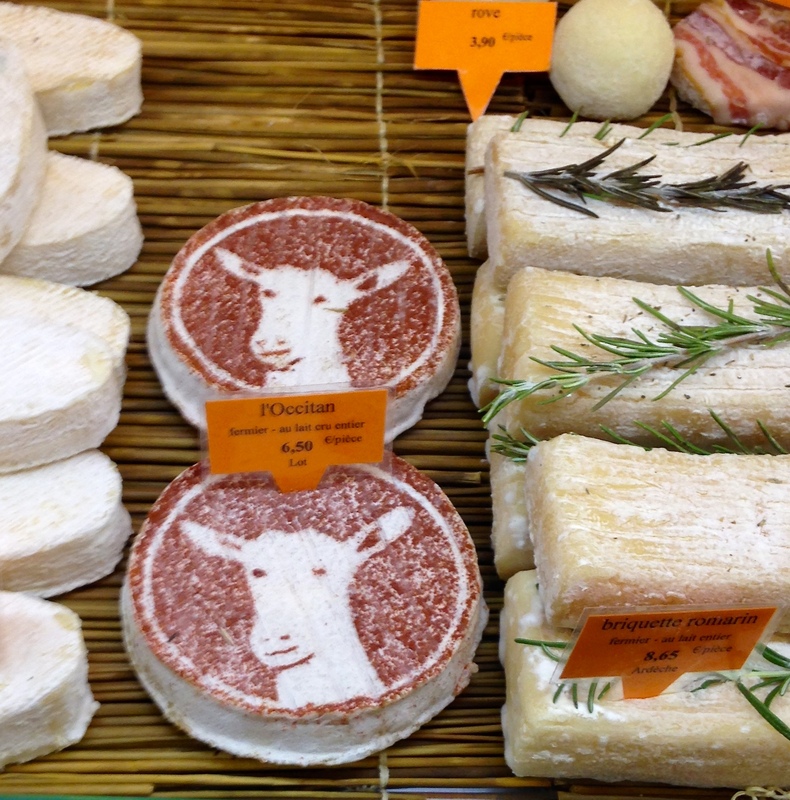 We were recommended to visit Le Francois Villon, 20 Rue de Boeuf by Fiona’s friends who live nearby and we were not disappointed. 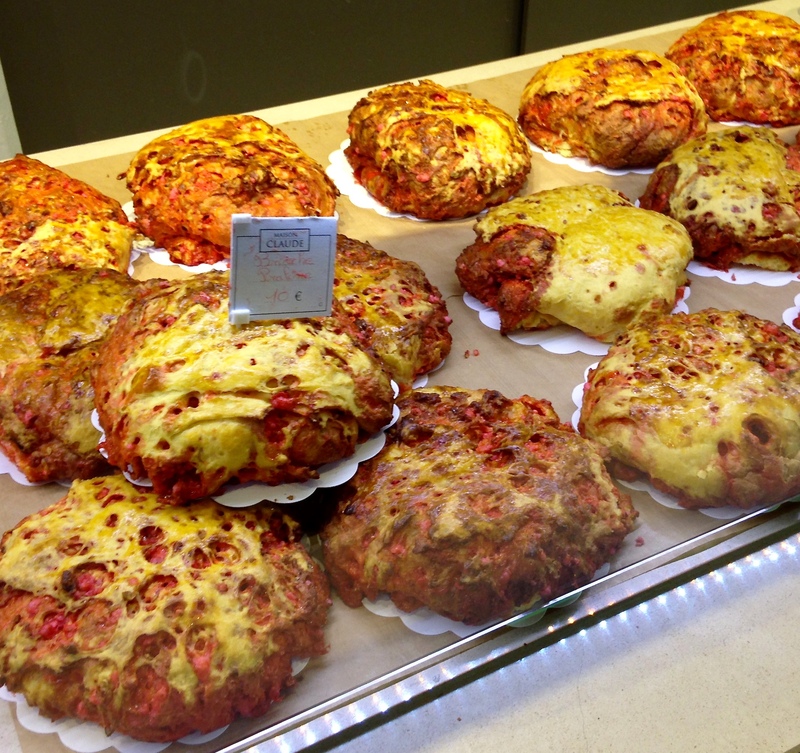 A gastronomic meat feast with Saucission Brioché – described by Simon as a French version of classic British “toad in the hole” , gâteau de foie et son coulis tomate – liver cake with tomato sauce, tournedos et sauce Saint Marcellin – Charolais fillet steak topped with sauce made with a local cheese . We drank a pot (46 cl) or two of house vin rosé Côtes de Provence. 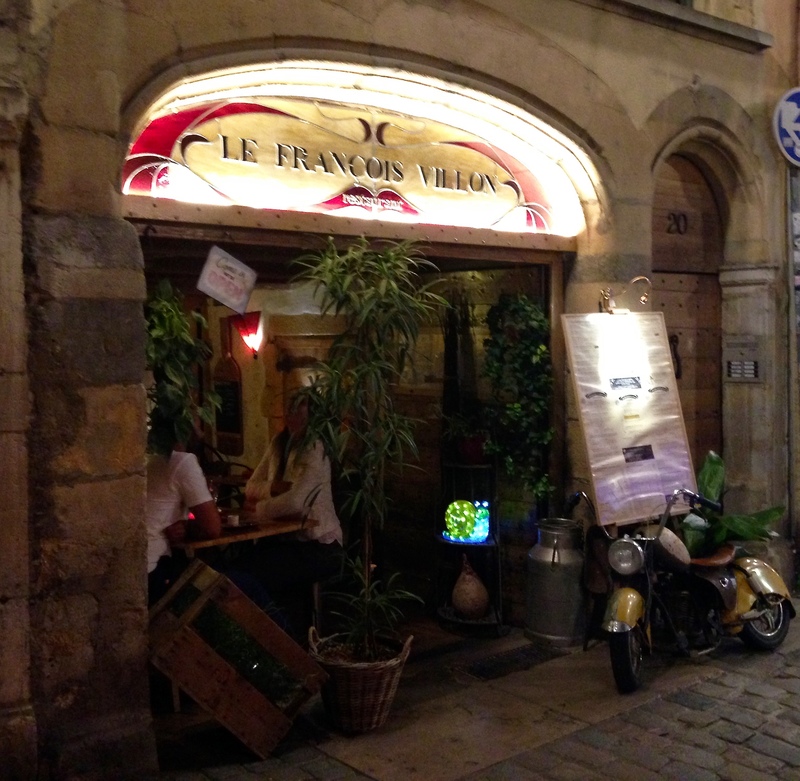 We also tried a few bouchons, the traditional bistro or tavern in old Lyon and our highlight was Les Ventres Jaune, 2 Place Neuve Saint-Jean. 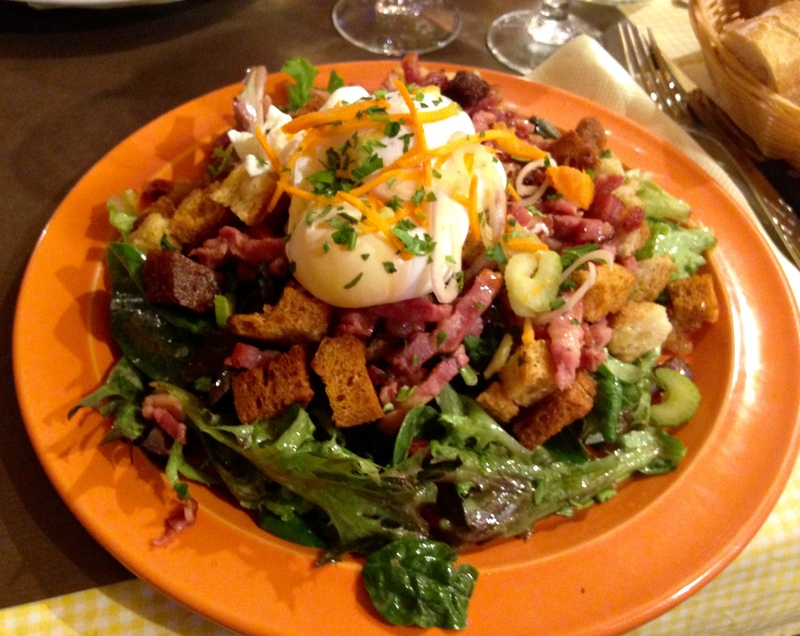 We started with a salad Lyonnaise -poached egg, lardons, croutons on mixed green salad) & oeufs en meurette- poached eggs on toasted brioche with red wine. 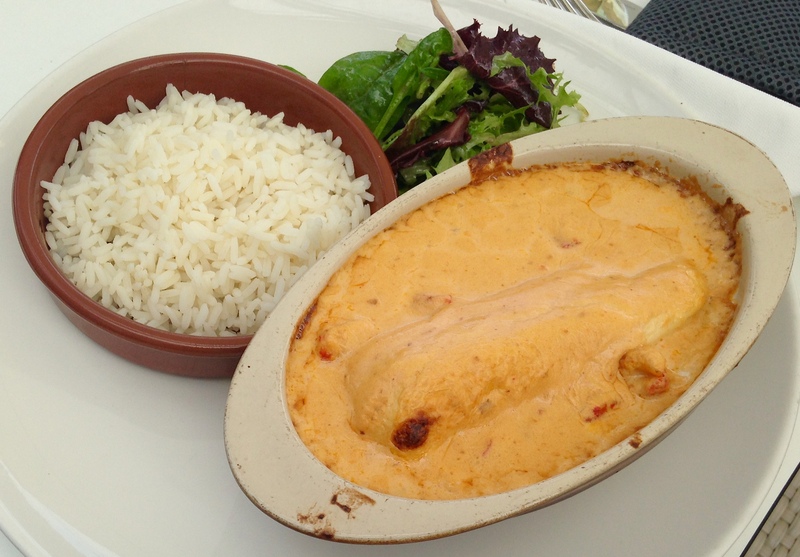 We then followed with quenelle de brochet sauce crustacés – a poached fish sausage made of Pike, served with a creamy seafood sauce and chicken in creamy sauce – made with the famous Poulet de Bresse, chicken from Bresse with an AOC (controlled designation of origin). 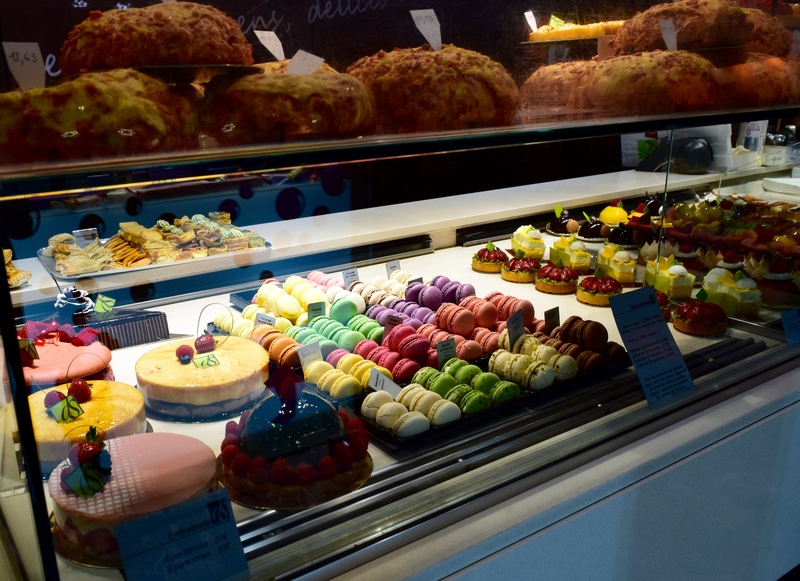 Our final highlight was a trip to the covered food market, Les Halles de Lyon – Paul Bocuse which we were recommended to visit on a Sunday, when the locals go out to shop and eat, as there are cafes and restaurants amongst the food sections. I cannot call them stalls as this was probably the poshest market I have ever visited. 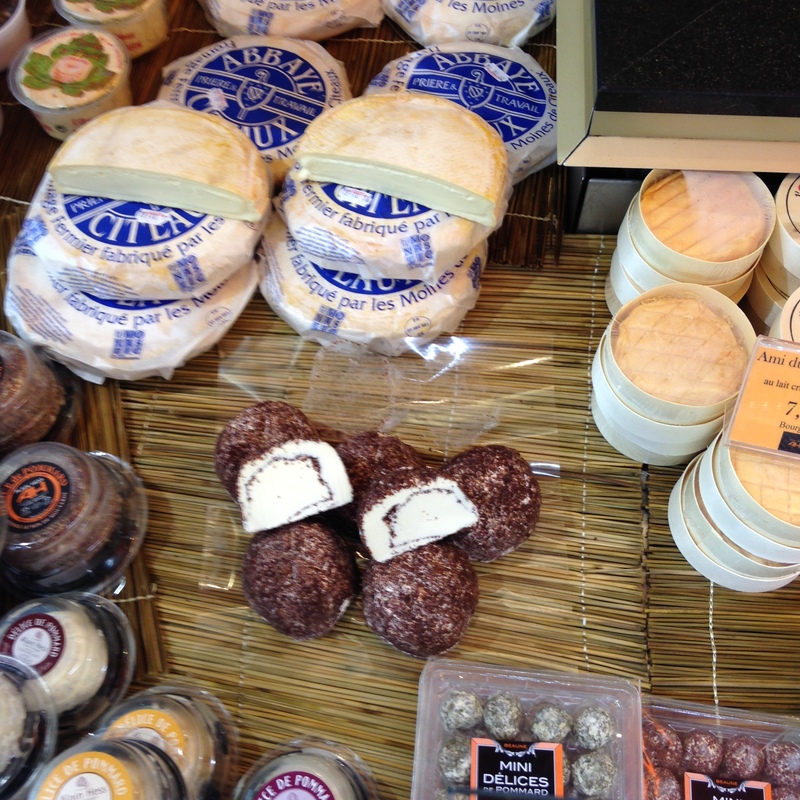 Displays of everything from local sausages, cheeses, seafood, snails, bread, patisserie, vegetables, fruit and flowers. 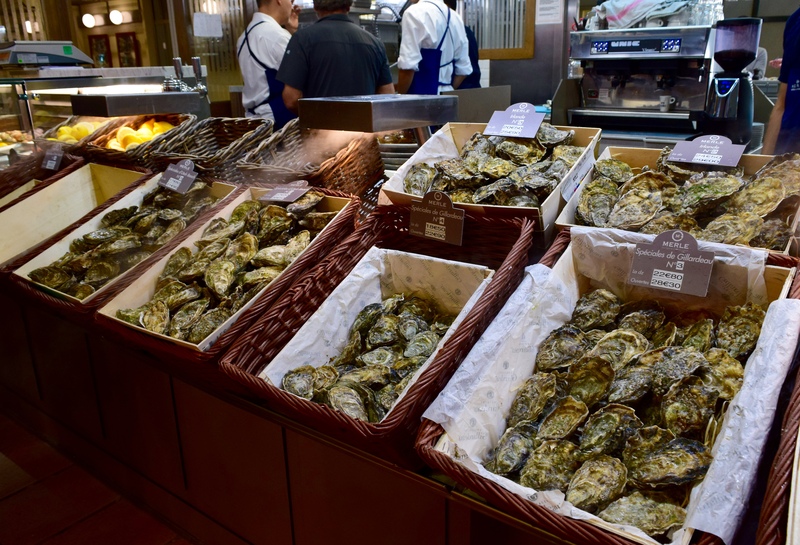 The locals were tucking into oysters with a glass of white wine for brunch! 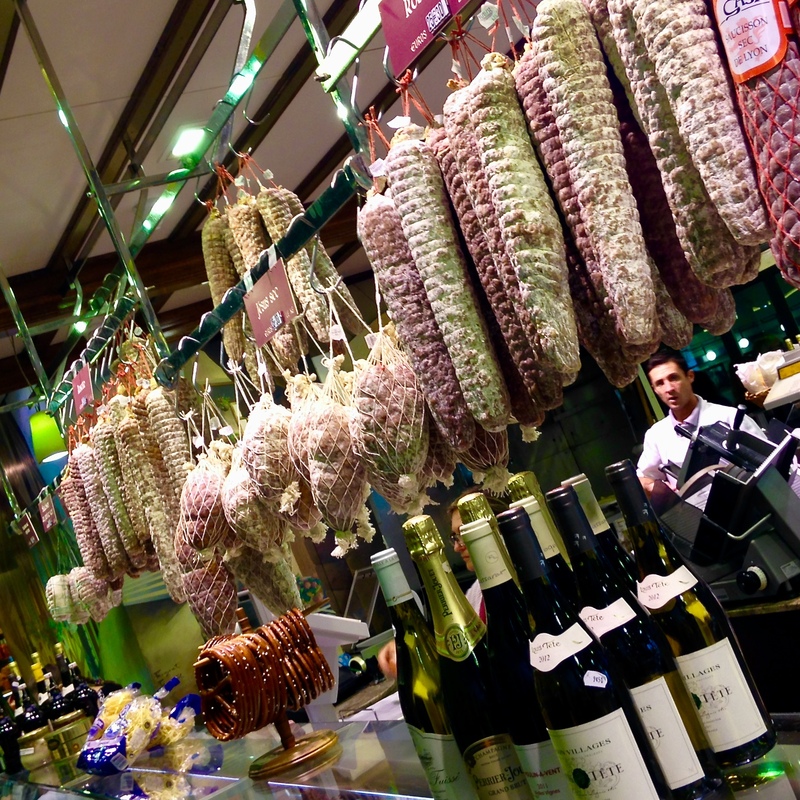 All in all a fantastic foodie holiday – a bien tôt Lyon et Beaune- see you soon! Brioche aux praline – pretty in pink!